A.R.Rahman at the Sydney 2010 festival!!! This was reason enough to stir out a flurry of excited activities among the Indians here. My daugther and son in law were eager to go with the entire family. Hubby and I however, decided to pass the noise, the rush and the waiting, and stay back home with our little grandaughter instead. My daugther’s friends had gone to the venue at Paramatta grounds at 11:00am itself to book spaces, for the show that was to begin at 7:00pm in the evening. They were undeterred by Sydney’s scorching Summer Sun beating down relentlessly! Such was the enthusiasm for the event! They had all decided to carry some homemade eats along, so that everyone could enjoy the assortment of home food while the ears feasted on the mesmerizing music of the century’s most celebrated maestro. After pondering on a tasty, filling, and yet ‘fast’ food, I suggested they take the easy to handle dosa sandwiches. Grinding batters with my daugther's small mixie is quite a task, and so I decided to do away with the grinding, and prepared these dosas for her by using flours that are readily available in the Indian stores instead. It turned out quite well and the group enjoyed their pot luck along with AR’s best music. Here is how I prepared it without grinding. 1. Mix rice flour, urad dal flour and salt together. 2. Finely powder beaten rice and fenugreek seeds, and add it to the flour mixture. 3. Blend in butter milk. 4. Keep blending with a clean hand, adding water little by little until you get a smooth and thick dosa dough consistency. 5. Cover and keep it in a warm place to rise for 8 hours or overnight. 6. Heat a greased tava. Sprinkle little water to test the temperature. If you get a hissing sound the tava is ready. 7. Pour a ladle of the batter on the centre of the tava and spread it into a moderately thick dasa. 8. Dribble oil around the dosa. 9. When lots of small holes appear, cover with lid and decrease heat. 10. Cook on low fire for a minute or until the top surface looks cooked. 11. Flip the dosa to the other side and cook for four seconds and remove from pan and leave it on flat surface to cool. 12. Increase heat and pour the batter for the next dosa. Mix one portion of dosai molagai podi (also known as Gun Powder) with one portion of sesame oil, and apply liberally on one side of the dasai. Fold the dosai in the middle and stack it up in a dry container or pack in a foil. Ideal snack for picnics and take away. You will get twenty five palm sized dosais for the above mentioned ingredients. A standard size drinking water glass was used to measure out the flour. We have all settled down far far away from farms and fields. But the custom of thankfully offering the bountiful farm produce to the Sun God during the harvest festival is still retained. It takes at least a whole week, and three to four dishes to finish off the entire pumpkin bought for the festival. 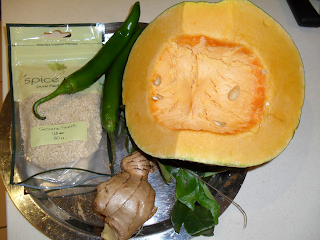 Pumpkin tastes delicious whether in sambar, raitha or tovvaey. 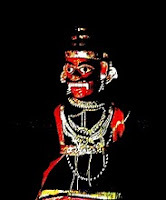 But it tastes most delicious in puli kozhambu, especially after gorging all the special dishes prepared for the feast. 1. Peel and cut the pumpkin into big cubes. 2. Soak and extract the tamarind juice and keep it aside. 3. Dry roast the sesame seeds till light pink in colour, and then grind the seeds into a coarse powder. 4. Heat oil in a thick bottomed pan and add mustard seeds. 5. When the mustard seeds splutter, add fenugreek seeds and bengal gram dal, and fry till golden in colour. 6. Next add the broken red chillies and asafoetida. 7. Throw in the green chillies, ginger and the curry leaves. 8. Now add turmeric powder, corriander powder, cumin powder and the chilly powder. Take care not to burn these powders, by immediately adding the tamarind juice before the powders get over fried. 10. Add salt , jaggery and the pumpkin pieces. 11. Add a little more water to cover the vegetable, and cover with a lid and cook. 12. After the pumpkin is cooked and soft (but not mashed), add a paste of rice flour mixed with water and boil for three minutes. 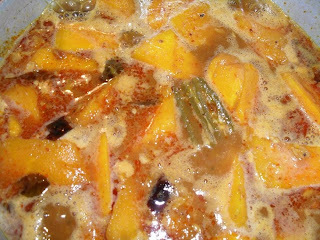 This is done to thicken the kozhambu. 13. Lastly add the coarsely ground sesame seeds and switch off flame. Relish the luscious pumpkin puli kozhambu with hot rice topped with ghee. It is the best accompaniment for Ven Pongal. - I also use coarsely powdered Yellu Bella ( prepared during the festival to exchange greetings with friends) for garnishing. It lends an awesome unique flavour to the kozhambu. - If the pumpkin skin is too hard to cut through, then just halve or quarter the pumkin, and cook it in a pressure cooker, by adding one and a half inches of water at the bottom. Cook for three whistles and cool. Cut into pieces and then remove the skin. Add these pieces when the raw smell in the kozhambu has gone, just before adding the rice flour paste. I wanted to prepare a quick and tasty biriani before my two month old grand daughter woke up from her mid morning siesta, and I wanted to achieve this without sounding off the pressure cooker or the electric mixer! This resulted in Vegetable Biriani-version 2. 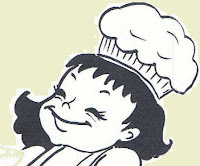 (Version - 1 has been published in the Blogger Aid Cook Book). Once the various groups of ingredients are gathered & prepared, and the pot is on the fire, you can enjoy this dish in just twenty minutes time. I used brocollini stems and baby corn too. 1. Soak rice and keep it aside. 2. Finely chop the green masala ingredients and keep aside. 3. Clean,peel and chop all the vegetables length wise into 1'' pieces. 4. Mince tomatoes and keep aside. 5. Grate ginger and garlic finely and keep aside. 6. Heat oil in a thick bottomed vessel and add the Group 1 ingredients - i.e. pepper corns, cardamoms, cinnamon and cloves. 7. When the garam masala sputters add curry leaves and then the soaked and drained rice. 8. Fry till the rice becomes translucent and sticky; switch off the fire. 9. Heat oil in another kadai and add the Group 2 ingredients i.e. green masala and the coconut gratings, and saute till you get a very pleasant aroma. 10. Now add Group 3 - i.e. 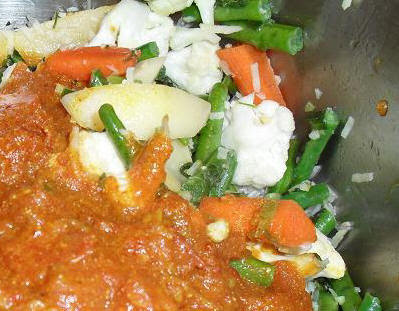 the cut vegetables and blend well with the masala. 11. 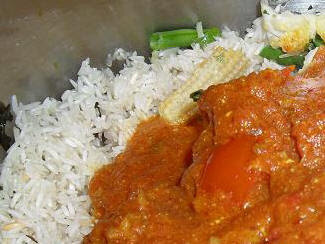 Switch off flame and add the vegetable and green masala blend to the rice pot. 12. Return the kadai to the flame and add oil. 13. When the oil is hot add the Group 4 i.e. grated ginger and garlic, and saute till it becomes golden brown. 14 . Add the chopped tomatoes followed by chilly powder, coriander powder,cumin powder and salt. 15. Cover and cook till the tomatoes become pulpy. 16. Mix in the curd and cook till the oil separates. 17. Pour the masala into the rice and vegetable vessel. 18. Add 2 and 1/4 cups of water and stir well. 19. Leave it on high flame till it starts boiling. 20. When it reaches boiling point lower the flame and cook for 15 minutes, covering it tightly with a lid. 21. Remove lid and stir the contents evenly with a spatula, without mashing it up. 22. Return the lid and cook for five more minutes until done and switch it off when the aroma of biriani is overwhelming. Roasted cashew nuts , fried bread pieces or slices of caramelized onion can be used for garnishing. A cold mint raita will be an excellent accompaniment.